Here are my new tools for cutting marble: the hardie, a steel chisel, embedded in a block of wood, and the steel hammer. I couldn't find a 6x6 block of wood, so I came up with the brilliant idea of gluing several pieces of 2x6 together. Seems to work fine, though it's not as attractive as a solid block would be. I'll keep my eyes open for a scrap. As my dear friend Margo warned me, there is a steep learning curve for cutting marble. I'm shattering about 20% of the pieces I'm cutting -- which are the 9/16-inch squares, the only mosaic tiles of colored marble that I could find in small quantities. I'd love it if all of them were the 3/8-inch cubes, but those seem to be in short supply. 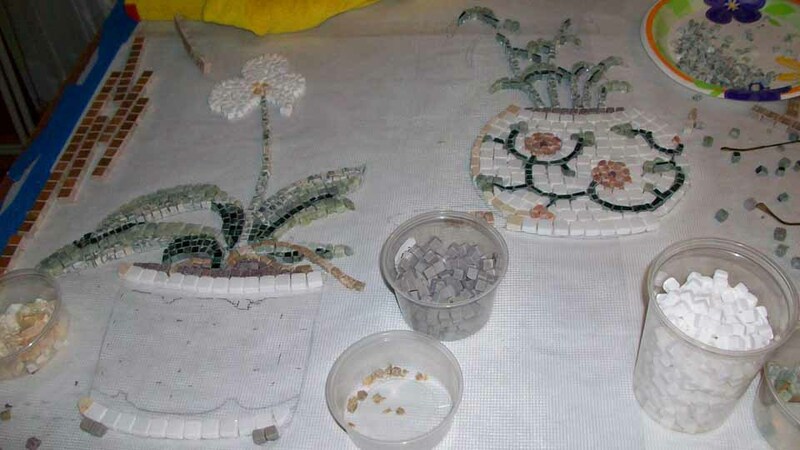 Also, I'm learning that different marble types behave differently when struck: The off-white called crema marfil cuts cleanly and evenly; the rosin yellow and pure white crumble very easily; the lotus green (a variegated white/green) breaks off in chunks. I've learned that I can make small cuts with a tile nipper, which helps too. I have learned something about marble chemistry. When I found out that blue marble is (gasp!) $70-$80 per square foot, I adjusted the design so I'd need only a third of what I originally planned, because I certainly didn't budget for that! A friend in the tile industry told me that that's because blue is not only scarce, but that what makes the blue color in marble is gold. Who knew? This method also has its particular hazards. While it doesn't have the sharp edges that glass does, every time I whack that hammer I run the risk of also whacking fingers and thumbs, which I've done more times than I like to think about. Somebody suggested holding the piece I'm whacking with long tweezers - brilliant! The only problem is holding the tweezers steady enough. But progress is being made. I've almost finished the two orchid pots that are the main features of this design; most of the rest is background, which will be a breeze. 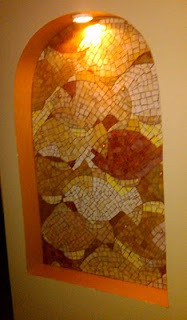 I just signed on to an exciting new project: a 3-by-5-foot mosaic in marble. Cutting marble tiles requires stronger tools than the wheeled nippers I use for glass or ceramic. I had to purchase an official mosaic hammer and hardie for this job. 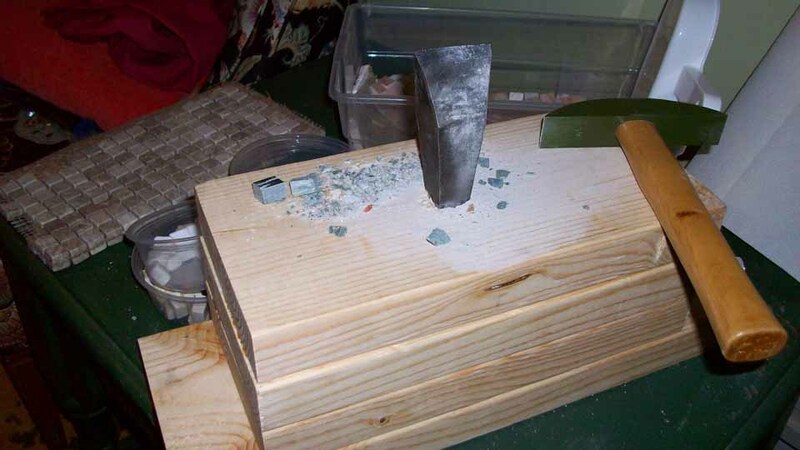 The hammer looks like a geology hammer; the hardie is a large chisel; both are made from steel. 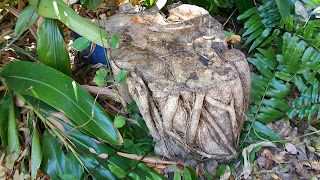 So why do I have a picture of a stump here? You have to sink the hardie into a block of wood, and many people use large stumps for the job because they are solid and sturdy. 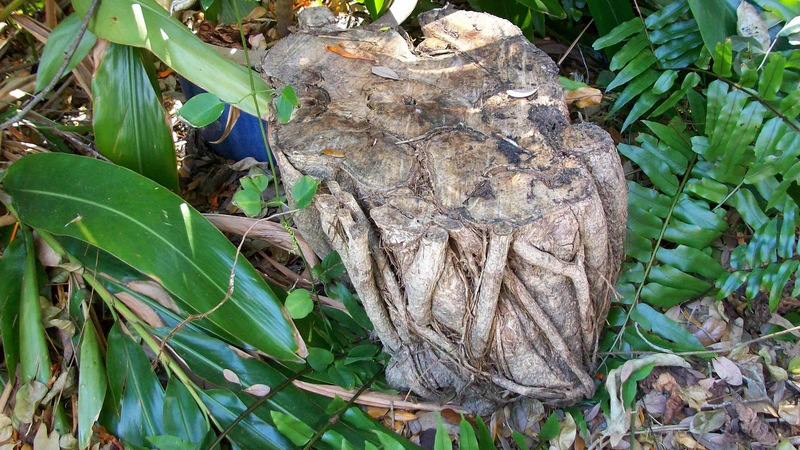 I found this stump of an old fig tree in the neighborhood and hauled it home. However, now that I have it here, I think it might just stay in my garden. For one thing, there's not a whole lot of room in my studio. For another, I'd probably have to fumigate it first. But I love its cross section with the whorls of fused vines. My other option for the hardie is to find a block of 6-by-6 post, which I like better than the stump for its portability; I can clamp it onto a table anywhere I'm working. Marble is a new material for me, but I've been wanting to do something in this medium for a long time, so I'm happy for the chance to jump in with both feet! This week I'm placing orders for the tile, and as soon as I get the hammer and hardie I'll set it up and start practicing. A friend told me that there is a bit of a steep learning curve for cutting marble, but I watched a YouTube video and it didn't look too hard, and I've been thinking about it for so long that I feel that I've already done it, in a way. Every act starts in the mind. I just received this photo from the client for whom I made this variation on my blue and green mosaic called "Summer School." Since they live across the state, I didn't install it myself. I think they did a wonderful job with the color of the alcove walls. Originally we had talked about adding flexible molding around the inside edges, but we both agree that this looks much better. Bravo John and Donna!